Each month Sweet Sparkle includes an info card with an intro to the theme, products sampled and their retail values. This month’s theme is “Moondust Galaxy” featuring 5 makeup products. Another set of lashes! I feel I’ve been getting them a lot in boxes recently. I am not a fan of the look of lashes this bold, and I am allergic to adhesive, so these just didn’t work out for me. I don’t think I’ve ever seen lashes this spidery from a box, and I think it was a rather bold choice for Sweet Sparkle. This is a new brand to me, and I was surprised to see the $16 price tag for a single shadow. I happen to really love a good blue eyeshadow, but this blue is more of an 80’s blue and not a striking modern blue that usually attracts me (cobalt or navy, anyone?). The texture is a cream to powder and was pigmented when I used my finger to apply it. For a matte lipstick, I was surprised at how smoothly this applied. The pigment was great, and it was more comfortable to wear when I applied a few layers. After an hour of wear it ended up feeling dry on my lips (even with a balm underneath), but I have inherently dry, sad lips. I don’t think this neutral shade works with the other colors in this box, but with another more neutral look, I think it could be really pretty. I know I’ve received this item in an Ipsy or Birchbox before, and I ended up donating it, so I wondered if this was some sort of cosmic thing where I just needed to try it after all. I do really like the highlighter, but the bronzer was hard to evenly get on my brush and it was a little too warm and shiny for my liking. Also, this pan size is so small for a full size, especially for the price tag. 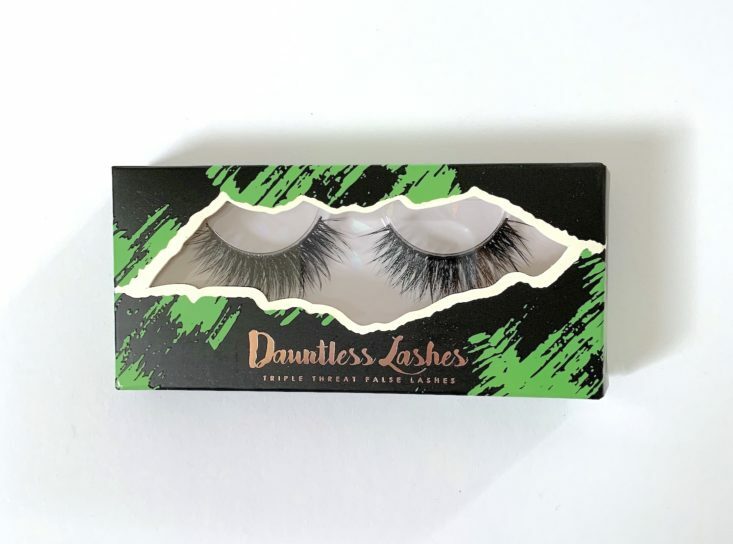 Be a Bombshell offers a lot of different products that make their way into subscription boxes, and I can’t really say I’ve liked the majority; this eyeliner is no exception. The consistency is thick, and the applicator was really difficult to work with. I have a habit of using a small eyeliner brush when this happens, and it went on okay. It was hard to build up color where I wanted it, and it wasn’t easy to layer on top of itself. All in all, this is a product I probably wouldn’t reach for again. Here is the look I came up with using all of the products (except the lashes) from this month’s box. I accidentally went ham on the bronzer, but I think I made everything else work out on me, but I wasn’t really feeling any of my new products. Verdict: Sweet Sparkle surprises me each month with some of their picks, and unfortunately this month wasn’t the best for me. The bronzer was a little warm and dark for my complexion, the lashes were crazy bold and I feel very meh about the lipstick and the eyeshadow. I wasn’t crazy about any of the items’ performances this month, but I enjoyed playing with each new product and trying to get them to work for me. What do you think of this month’s Sweet Sparkle box? I was interested in this box, glad I held out. Everything in this months box would have been donated. It seems like leftovers from other boxes. Thank you! It really didn’t seem to go together for me either. Amazing how you can take a bunch of make up you don’t like and totally rock it!! Loved your review and your honesty. It is appreciated. You did a good job with the shadow but the color does seem dated. Thanks! The shimmer makes it a little more modern, but it is still a pretty bold choice. I love that blue! (But then I’m obsessed with Merryweather from Sleeping Beauty.) Ipsy sent that blue shade, a slightly darker blue, & an apple green a while back, & I was soooooo disappointed that I didn’t get any of them, lol. I love the Steve Laurant lip oil and the brand is somewhat pricey.